The Continuous Casting Consortium (CCC) encompasses a cooperative research effort between the University of Illinois, the Steel Industry, and the Government (NSF Project). Its purpose is to develop comprehensive mathematical models of the continuous casting of steel slabs and to apply these models to improve understanding, optimize the process, and solve practical problems of interest to the participating members. The Consortium was formally created in 1991 to provide a vehicle for continuing industrial interaction on work begun by Professor Brian G. Thomas in connection with his National Science Foundation Presidential Young Investigator Award. 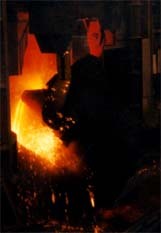 The idea for the CCC started in 1986, when Armco, Inland, and Bethlehem Steel cosponsored a project to model the continuous slab casting process. Together, the members co-sponsor research projects at the University of Illinois under the direction of Prof. Thomas, and share the expenses and the results of the research. In addition to funding the research, each company also supplies experimental and industrial facilities for obtaining data for validating the models and conducting trials to implement suggested improvements from research. Visit our Membership Page for more information about the member companies and the benefits of membership.